Q: What is your favorite thing to do in your free time? Senecal: Going road tripping with my friends and watching TV. Senecal: Seeing my friends every day. 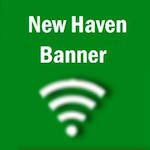 Q: While attending New Haven High School, who is one teacher you will remember the most? Senecal: Mr. Bounds because he made my time at school fun. Q: Your best memory from school? Senecal: Winning Basketball Districts and Kim Conner on the Softball bus rides. Q: If you could meet any one person who would it be? Q: What are you looking forward to most this year?